It should no longer surprise me when a second recording from an artist, who hit a home run on her/his first release, equals or even surpasses her/his earlier work. 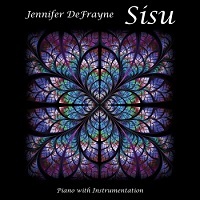 However, Jennifer DeFrayne's Sisu is not just better than her debut, which is already high praise, but it is a work of such emotional depth, technical artistry, and self-assuredness, that I am left wondering "Where has this remarkable woman been all this time?" On her second album, the talented pianist channels her Finnish ancestry. DeFrayne was raised in the upper peninsula of Michigan, an area settled by immigrants from Finland. The album's title is a Finnish word, quoting from Wikipedia: "Sisu is a Finnish concept and cultural construct that is described through a combination of various English terms including stoic determination, grit, bravery, resilience, and hardiness and is held by Finns themselves to express their national character. Sisu is a grim, gritty, white-knuckle form of courage that is typically presented in situations where success is against the odds. It expresses itself in taking action against the odds and displaying courage and resoluteness in the face of adversity, in other words, deciding on a course of action and then sticking to that decision even despite repeated failures." DeFrayne has found a way to translate those descriptive phrases into music. The result are songs that are brave, passionate, strong, evocative, and without being able to delineate how, do indeed portray the various strengths of character as laid out in the quote above. Of course, musically, DeFrayne (as she did on her ZMR-award winning debut, By A Wire) displays amazing command of her instrument, whether exploring subtlety and nuance or pouring her heart and soul into the ivories, reflected her inner strength and determination (which mirrors the titular term of course). The music on Sisu is varied in tone, style and mood but it always flows and/or pulses with deep-rooted emotion. You can see by the list of guest artists above that the pianist is joined by stellar talent. Add to that an expert job of engineering (recording, mixing and mastering) by partner Corin Nelsen and it all adds up to a recording that is filled with great music that also sounds fantastic. DeFrayne’s liner notes, while not copious, delve into the origin of the titular word as well as brief descriptions of each song. It’s a warm, personal touch. None of the album’s twelve tracks are solo, as there are a minimum of two guests on each song. While DeFrayne doesn’t hog the spotlight, this is still every inch her album with the piano being the focus most of the time. That doesn’t diminish the efforts of all these other great musicians, but is only meant to emphasize this is less of an ensemble recording and more about the others bringing their considerable talent to bear when appropriate. “Be Who You Are” has a sweet, playful nostalgia to the melody, with DeFrayne’s piano prancing throughout the tune gracefully. As one might expect, the title track features a subtle yet palpable sense of gravitas wedded to power (especially as the track progresses), highlighted by DeFrayne’s nuanced playing as well as Manring’s bass, Milonovich’s violin and Tubbs’ EWI. On “Beyond,” the power also gradually builds throughout the track and features some tasteful bluesy riffs courtesy of Oster’s flugelhorn. Pearce’s ambient guitar lays down a moody bedrock of atmospheric texture. “Gathering” conveys a gradually escalating sense of celebration, as if the piece were a time-telescoped soundtrack to a holiday meal as relatives near and far arrived until the house was filled with love and good cheer. Haley’s beautiful English horn, playing unaccompanied, opens “Renew,” a piece that addresses, musically, some of sisu’s (the word itself) qualities, as does the concluding “Perseverance,” a lovely closing track, which features a hint of melancholy and an underlying emphasis on inner strength which lies at the heart of the Finnish characteristic. Having met Jennifer in person, her genuine warmth and sense of humor are indicative of an uncommon lack of pretension for someone who composes and performs such evocative, emotional music. Sisu is a deeply personal musical voyage that you will want to take many times, exploring the nooks and crannies in each track. It’s easy to see why it has enjoyed the air play success it has.